Trust is a word of crucial importance on a house-sitting website. You need a healthy dose of trust to entrust your home to strangers, right? But what is a trusted website? What does it mean to be a trusted host or house-sitter? 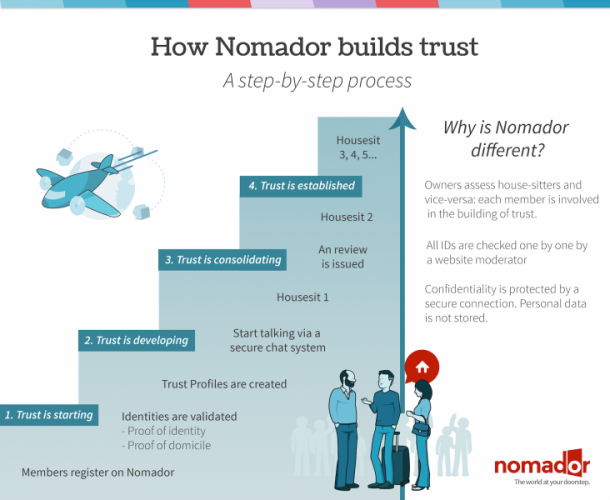 How can you build trust on Nomador, step by step? Nomador is a secure website. On Nomador all members have their ID checked before they can contact an owner. This is a totally new feature on a house-sitting platform so far. This allows owners to view the Trust Index on Profiles (the sum of the documents that were submitted to the website moderation). These ID checks mean a lot of work for us: we examine thousands of documents one by one, before validating them or not. But this is a necessary step to lay the foundation of trust, the one which is common to all Internet matchmaking activities: knowing that a person has a real identity. On Nomador, you can use tools to build trust step by step. An internal messaging system. Take all the time you need to get to know one another using the Nomador secure email communication channel. Introduce yourselves, find out what you have in common, raise any issues that could be troublesome, exchange detailed information about the house-sit. Articles like these one will give you some useful tips to select the right house-sitters or to select the right house-sit. The assessment system. We designed ours so that it is really house-sitting related. Each personality emerges through badges that reflect the member’s main qualities. Written recommendations may also be displayed by subscribers. Subscription gives access to some of the website’s advanced functionalities. Acquiring subscriber status proves you are motivated to use the system, and is a further means of consolidating the identity check process (subscription requires on-line payment). Subscribers can if they wish opt for restricted access to some of the details of their advert (subscriber-only access). On nomador, there is an active and vigilant moderation team. Requests for registration are regularly reviewed by a member of the moderation team. New adverts are reviewed by a moderator who can intervene if a message or presentation does not follow house rules. Nomador is a community of people who share common values. Global awareness and to always strive for deeper understanding. When people choose to join the Nomador community it indicates to all that they share these states of mind and values. Not just that they want to save money on pet boarding solutions or on accommodation. Like any community, we attract people who recognise part of themself in us, and this is also a way of building a trusted community.